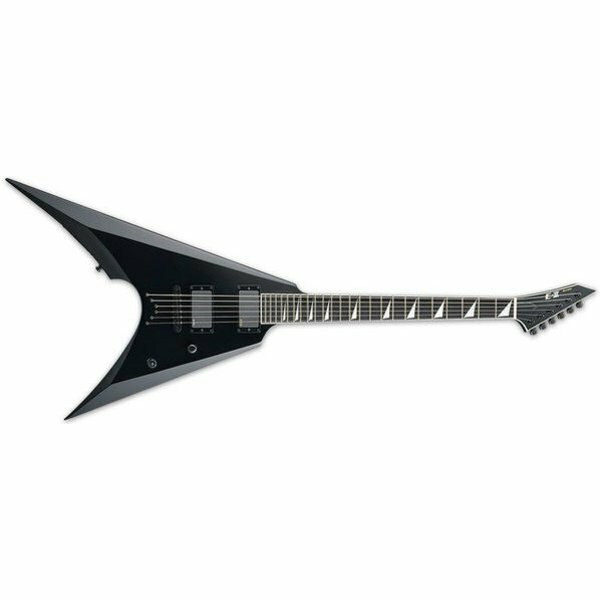 Completely unique in its bold design, the ESP E-II ARROW is a guitar designed for pure high performance that will stand out from the crowd. Like all ESP E-II models, the Arrow is made in Japan at our ESP factory. Offering neck-thru-body construction, the E-II Arrow offers a sound as powerful and aggressive as its looks, with a set of EMG 85 (neck) and EMG 81 (bridge) active pickups. It has a light alder body with a three-piece thin U-shaped maple neck, and an ebony fingerboard with 24 extra-jumbo frets. High-quality components on the E-II Arrow include Schaller straplocks, Gotoh locking tuners, and a Floyd Rose Original bridge. Available in Black finish. Includes hardshell case.